Parker Pie Restaurant in West Glover is a must see if you are in the Kingdom. There are a number of things that make this place unique; the food is made with high quality, local ingredients; and the outdoor space can’t be beat. We’ve been going to Parker Pie since they opened so this review will focus on more than one trip. What strikes you about the Pie on your first trip will be the atmosphere – there is nothing else like it. There is something homey, friendly, community oriented about it – and no matter where you are from, it is infectious. Let’s start here: This is a pizza place, so most of the menu consists of pizzas and calzones. There is a really nice specialty list that includes some unique combinations, and some classics that we first experienced at the Pie. 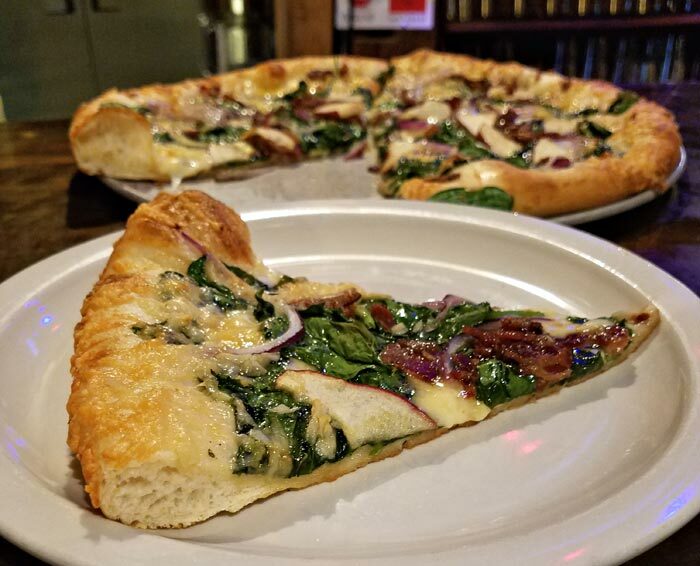 The Green Mountain Special, the margarita pizza, and Scott’s Revenge are 3 choices that were once unique to the Pie, but the first two have found their way onto other local menus. Scott’s Revenge is a spicy pizza that features a hot oil made by a local man (Scott) that was one of the original cooks – his hot oil can be found in a number of menu items, including the revenge mayo for fries. The pizza here is New York style, with ultra thin crust cooked to be crispy. I have heard from a number of New York natives, New Jerseyites, and other lower New England visitors that Parker Pie is the only place in Vermont to get truly great pizza. Our favorite pizza is the Green Mountain Special. This pie contains no tomato sauce. Instead the crispy crust is topped with a layer of cheddar cheese that makes the perfect bed for onions, baby spinach, crispy bacon, and thinly sliced apples all drizzled with maple syrup. This is truly a Vermont pizza. The flavors complement each other perfectly, and it quickly becomes addicting. 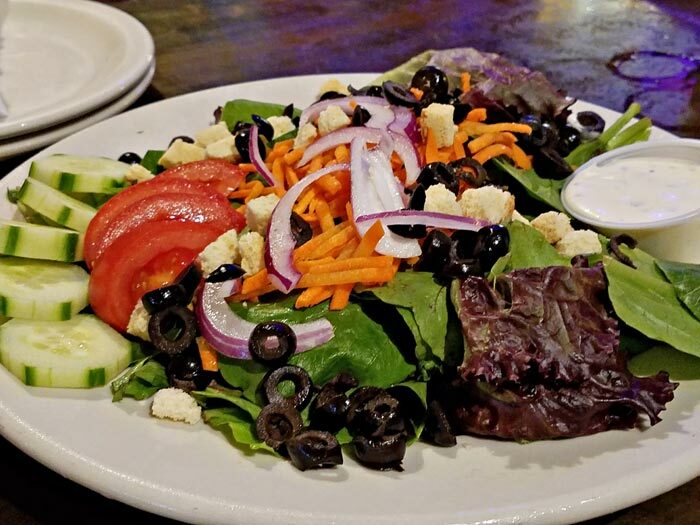 We are huge fans of their salads. Made with all fresh produce, much from local farms and greenhouses while in season, these salads are huge (it takes two of us to finish a dinner salad). 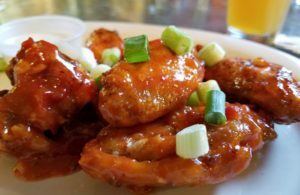 My husband loves their spicy Thai wings, sweet and spicy at the same time – and full of flavor. Maple BBQ, Spicy BBQ, buffalo, and Scott’s revenge wings are all also available. My favorite start is the spinach and artichoke dip. This mix is creamy, doesn’t contain large chunks, and is served bubbling hot! I am also a huge fan of their poutine. 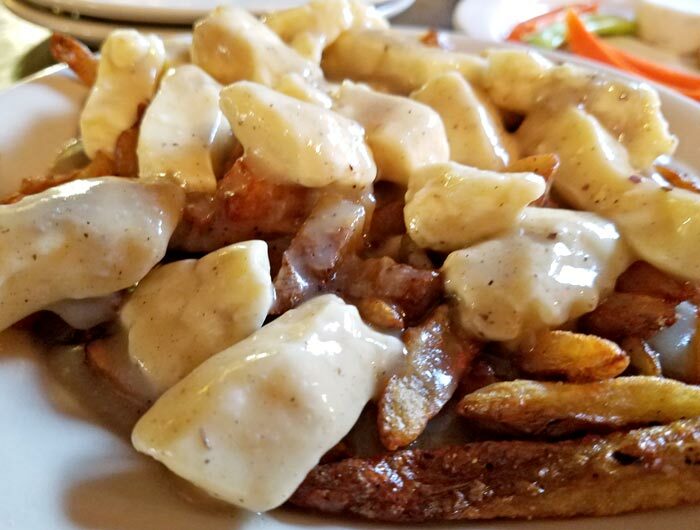 It is made from fresh cut fries, covered in chicken gravy made from local chickens from Hillside Farm in Albany (I think they are the only local place that serves their poutine with chicken gravy), and covered with cheese curd from Sweet Rowen Farm in West Glover. Over all 24 Vermont businesses contribute to the food quality at the Pie, with all but 7 being from the Northeast Kingdom; and because they are part of Black River Produce, the Pie gets great produce even in the dead of winter. Their food is a bit more expensive than other local pizza places, so it can get expensive with a large group, but the produce quality is incredible. And the knowledge that a number of local farms and businesses are being supported makes a slightly higher price well worth it. Now, Parker Pie is synonymous with great beer in the area. They were one of the first places to feature Hill Farmstead beer on tap, and continue to feature different beers from the local brewery on a regular basis. With taps in the front and the back bar, there are always interesting new brews on the line up; from light to dark, hoppy to citrusy, and even sometimes sweet (they once had a smore beer that was quite interesting), there is always something fun to try. A list of classic bottled beer, and a long list of wines by the glass or by the bottle round out their drink selection. Beyond that, separated by a small swinging door is the dining area of the original Parker Pie. Booths, small tables and a great metal bar (custom made for the Pie) make the whole place inviting and lend to that country dining experience. You are immediately put at ease and comfortable. In the summer, the place is always packed. Children run around from their parent’s table through the back door into the yard. There are always people standing, talking to each other or the bar tenders, or making conversation with the table next to them. The walls are covered with a local artist’s work, part of a revolving gallery that changes up every few weeks. Go out the back door and you are on a very large deck with a few standing tables and picnic tables. Kids and adults play in the large yard, as a parent I found this to be among the best and most unique features of this restaurant. There are a few more tables in the yard, and often people sitting and eating in the grass. Off the side of the porch is another door leading to the “barn”. This renovated barn is also known as the ‘back bar’ and is home to a large bar, a number of other tables, and a large harvest table for big groups or communal eating. 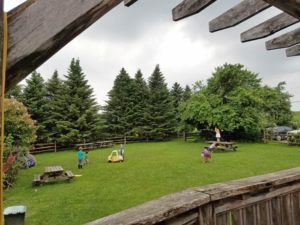 People get cozy at the Pie, talking to people standing next to them, sharing tables when space is limited, and with children playing outside – you are bound to meet other parents. This all lends to a feeling of community and commonality that makes this place more than a restaurant – It really is a gathering place. Throw a few old style checker tables in store, and you have a place right out of a Norman Rockwell painting. Every night of the week there is something interesting at the Pie. Monday nights in the summer are Trivia Night – the winner gets a $25 gift certificate at the Pie. Tuesdays are $2 taco night with select $3 draft beer. Wednesday is burger night – and there are some unique and scrumptious burgers that come through here (In the winter trivia night is held on Wed. as the restaurant is closed on Mon.). Thursday is music night and a number of acts come through. 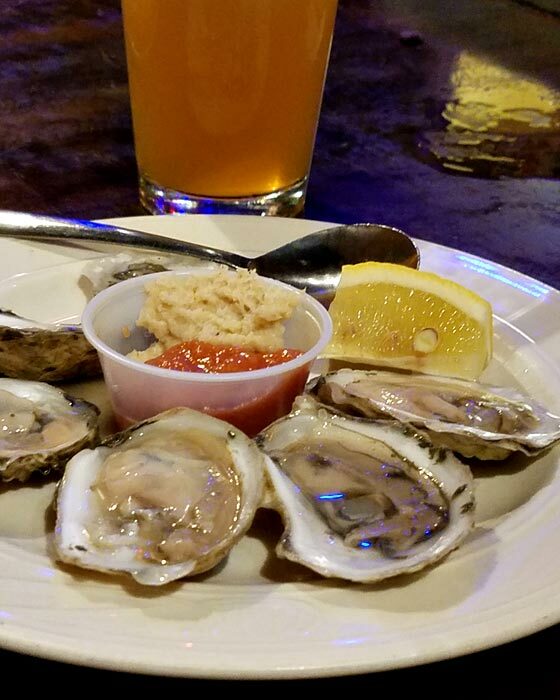 Friday is oyster night – different oysters from different parts of the country are featured every week. Some Friday’s there is music upstairs in the Barn, in what is called Village Hall. Sometimes it is a band, other times Karaoke. Saturday’s are reserved for bigger bands in Village Hall. And Sunday’s are a great day to go with the Family as there is a pizza deal (Paint and Sips are on select Sundays). Though parking can be difficult on busy nights, and often you have to walk from a lower parking lot; and though the air is filled with the smell of Vermont farms – this adds to the charm. Inside people know each other by name – even summer guests and summer residents. Many of them met at the Pie and see each other every year. If you’re from the area and haven’t been there – it truly is a place you have to experience; and if you are just visiting – add it to your list of Travel stops!